The Ford Mustang is an American icon of performance. For decades driving enthusiasts have revered the Mustang for its V8 engine, rear wheel drive, classic styling, and affordability. But like any other vehicle, drivers quickly look for ways to extract more power and improve the driving experience. An aftermarket exhaust achieves both of these objectives. The increased flow improves functionality by allowing the engine to operate more efficiently and produce more horsepower and torque. V8 engines tend to respond especially well to aftermarket exhaust systems because of the large amount of air they move. Along with the increased performance an aftermarket exhaust system has a more aggressive exhaust note that can be enjoyed by the driver and onlookers. An exhaust system is only as efficient as its most restrictive unit, an in many cases the factory x-pipe is the bottleneck of an exhaust system. The x-pipe section evens the exhaust pulses with a synchronized crossover in the center section, resulting in a deeper, smoother tone. Replacing the factory x-pipe with a Kooks unit will greatly increase exhaust flow as well as provide a deeper tone. The factory x-pipe is designed for ease of manufacture, noise reduction, and cost reduction. These objectives obviously clash with the expectations of a car enthusiast. The improved sound, torque, horsepower, and throttle response of a Kooks X-Pipe makes it a crucial piece in the modification of any vehicle from a daily driver to a full race car. 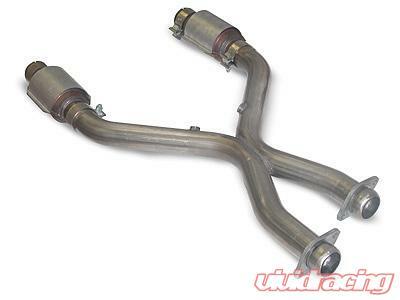 A Kooks X-Pipe is one more way to increase airflow in and out of the engine and maximize exhaust flow.